The College of Education at the University of Florida ranks among the top education programs for military veterans nationwide, according to a new national ranking. Two of the college’s specialties rated in the top 10 for providing the best education for veterans among colleges of education nationwide: Teacher Education Subject Specific (No. 3) and Special Education (No. 9), said College Factual, a Troy, N.Y.-based education technology company. Overall, College Factual ranked the UF College of Education No. 12 among 460 colleges surveyed. Separately, the University of Florida ranked No. 5 among the best universities for veterans. 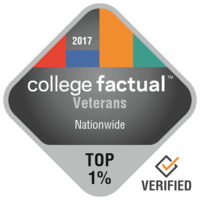 College Factual said its ranking includes factors that are important to “non-traditional” students, a category that includes most veterans, such as accreditation, flexible course offerings and student spending, while ignoring factors that are not, like SAT scores. College Factual noted that since the creation of the Post 9-11 GI Bill, there are more opportunities for veterans to pursue graduate studies. The Veterans Administration will pay all the tuition and fees for graduate and undergraduate programs at the in-state resident rate at a public institution. UF says this means that the VA will pay the entire cost of any program at the University of Florida for eligible vets who are Florida residents. This latest ranking was included in College Factual’s updated 2017 Best Colleges Nationwide ranking released on Jan. 12. Overall, College Factual said UF College of Education ranked No. 8 out of 449 college of education. On Jan. 9, U.S. News & Reports announced the College of Education’s online graduate education program ranked No. 1 in the nation for the second year in a row. Last March, U.S. News rated the college’s overall graduate programs No. 20 among U.S. public colleges of education. UF’s Special Education and Counselor Education programs each were rated in the top six nationally in their disciplines.